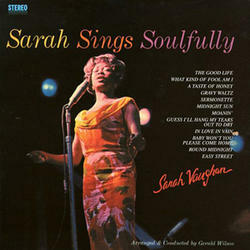 Sassy's years on the Roulette label (1960-64) have been called the legendary singer's finest hour, a time when Vaughan's musicality merged exquisitely with her unbridled vocal ardor to achieve the sublime. "Sarah Sings Soulfully", recorded at the close of that period, stands as a stunning testament to this claim - a divine collection of tracks that reveals an artist staking her soul on the rendering of each and every note, as well as the silences between them. Seductively spare, luxuriously poignant, and achingly honest all at the same time, Vaughan's vocals careen incandescently through the 12 standards presented here, swooping, sighing, and soaring with an intensity that remains unparalleled to this day. Listen to her reading of the "Just Let Our Love Take Wing" line on the version of Monk's "'Round Midnight" found here: the fat, luscious drop of the word "just", the long fermata on "love", and the dip and swell that pulls the phrase forward on "take". It's a moment of revelation - and incredibly, only one among the many that shimmer throughout this collection.